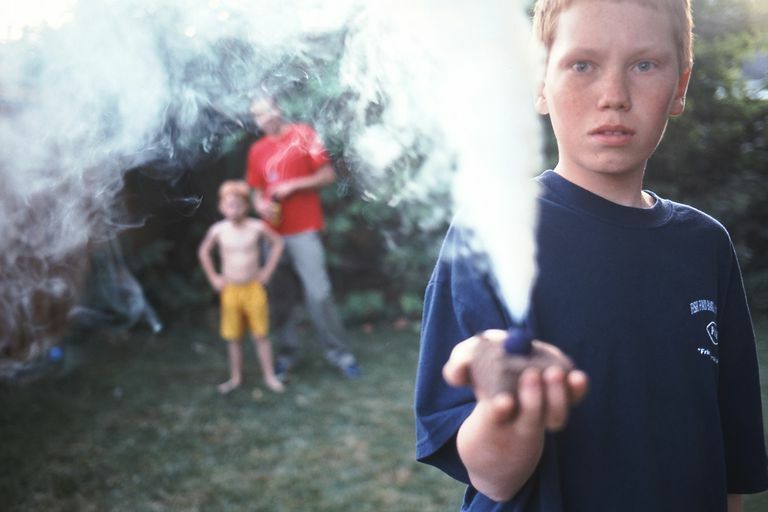 The smoke bomb you would purchase from a fireworks store usually is made from potassium chlorate (KClO3 - oxidizer), sugar (sucrose or dextrin - fuel), sodium bicarbonate (otherwise known as baking soda - to moderate the rate of the reaction and keep it from getting too hot), and a powdered organic dye (for colored smoke). When a commercial smoke bomb is burned, the reaction makes white smoke and the heat evaporates the organic dye. Commercial smoke bombs have small holes through which the smoke and dye are ejected, to create a jet of finely dispersed particles. Crafting this type of smoke bomb is beyond most of us, but you can make an effective smoke bomb quite easily. There are even colorants you can add if you want to make colored smoke. Pour about 3 parts potassium nitrate to 2 parts sugar into the skillet (5:3 ratio is also good). Measurements don't need to be exact, but you want more KNO3 than sugar. For example, you can use 1-1/2 cups KNO3 and 1 cup sugar. If you use equal amounts of KNO3 and sugar, your smoke bomb will be harder to light and will burn more slowly. As you approach the 5:3 KNO3:sugar ratio, you get a smoke bomb that burns more quickly. Apply low heat to the pan. Stir the mixture with a spoon using long strokes. If you see the grains of sugar starting to melt along the edges where you are stirring, remove the pan from the heat and reduce the temperature before continuing. Basically, you are carmelizing sugar. The mixture will melt and become a caramel or chocolate color. Continue heating/stirring until the ingredients are liquefied. Remove from heat. Pour the liquid onto a piece of foil. You can pour a smaller amount onto a separate piece, to test the batch. You can pour the smoke bomb into any shape, onto an object, or into a mold. The shape and size will affect the burning pattern. If you aren't going to clean your skillet immediately, pour hot water into the pan to dissolve the sugar (or else it will be harder to clean). Clean up any residue you may have spilled out of the pan, unless you want mini-smoke bombs on your stovetop. Allow the smoke bomb to cool, then you can peel it off the foil. The solid smoke bomb material is flammable and can be lit directly. You can light your smoke bomb using a lighter, preferably one of the long-handled types used for barbecue grills. Only light your smoke bomb in a well-ventilated area, on a surface that won't catch fire. The smoke bomb will burn vigorously (more slowly with a higher percentage of sugar) with a purple flame. Alternatively, you could place a short length of fuse into the smoke bomb when you pour it, and then light the fuse. A variation on the saltpeter/sugar recipe is to replace the granulated sugar with powdered sugar (icing sugar). The powdered sugar and potassium nitrate are sifted or mixed together and left in powdered form. The powder is ignited to form smoke. Mix the zinc and sulfur. Insert a red-hot wire to ignite the mixture and produce smoke. This is a particularly smelly smoke bomb. The recipes for colored smoke bombs require chemicals that may not be readily available unless you have access to a chemistry lab, but it's worth knowing how it's done. Parts or percents are by weight. The ingredients are sifted together and ignited to produce the smoke. Reference: The formulations for colored smoke bombs came from Wouter's Practical Pyrotechnics, who cited the recipes as originating from L.P. Edel, "Mengen en Roeren", 2nd edition (1936). Essentially, you are adding metal salts to get colored flames. You may get additional ideas from looking at the Flame Tests, Fireworks Colors, and How to Color Fire tables. The metal salts listed here produce a relatively safe smoke. Use caution when considering other metals salts, as some compounds may produce toxic smoke.